In Viking Valley you will meet the inhabitants of Njardarheim, who will take you 1000 years back in time. In Njardarheimr, you have the opportunity to actively take part in a society where people are very eager to convey the history of the vikings, how they traveled, interesting information about their boats and about how the viking era has affected our modern society. You will be able to wander around freely and experience the various buildings and activities that Viking Valley has to offer. You will learn more about construction traditions, religion, food and crafts. 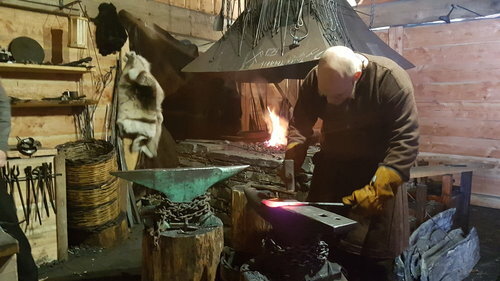 However the best way to learn about the viking era is to participate in "The Viking Experience", a 45-minute tour that is included in the entrance fee, and starts every 30 minutes during the summer season. The viking village of Njardarheimr consists of more than 20 buildings and more are being planned. The houses were built and reconstucted by using the knowledge and experience of how they were built in the Viking Age. All the decorations are based on styles from the Viking era, but with our own design. The buildings have been built by using material found here at the Nærøyfjord, e.g. peat and shingle, as on the stave churches. In the Viking village you can participate in activities, see attractions, talk to the inhabitants of Njardarheimr and learn more about the Viking Age. You can experience the thrill of archery, ax throwing and learn about the Viking games and experience the smell of tar and bonfires. Join the daily activities of the Viking families in Njardarheimr! Gathering for meals was important in the Viking era. In "Heidrun" you can taste food prepared by old methods with the ingredients they had available. On the menu you will always find the Viking soup with coarse bread, homemade sausages with cabbage salad, freshly baked pan bread with salmon or salami, and ramson sour cream, in addition to fish and meat from the grill with accessories appropriate for the time period. In Njardarheimr we sell food, and also give you a historical food experience.